Dash away spatters with our premium button spats in black canvas! Nice quality. My husband loves them! 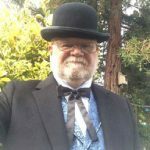 I am a professional living history entertainer and as such, my costumes must stand up to regular heavy use. 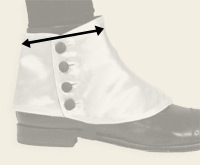 I was very pleased to find that the materials used in making the spats was of good quality and should stand up to regular use and laundering. Thanks for an affordable option. This product was here is an relatively short amount of time. Also, it is what they say it is. I have to say that their merchandise has great quality to it.